Want to impress all your family and friends? 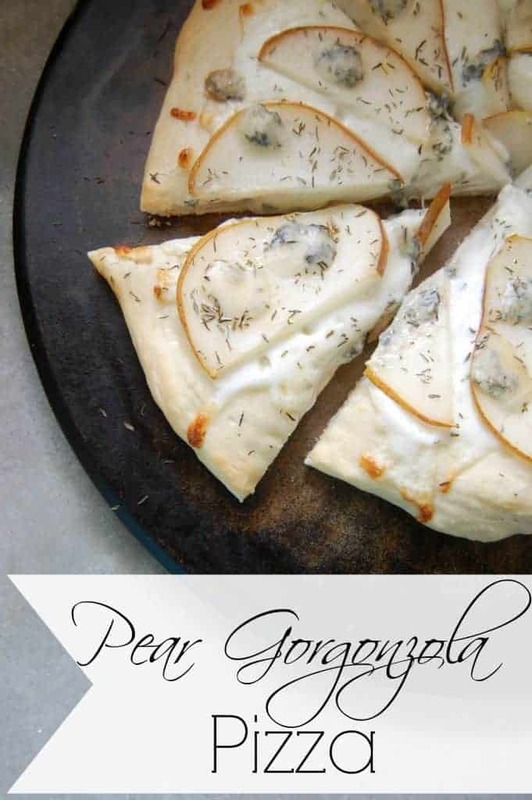 Then you need to start making this pear gorgonzola pizza! This pizza just screams creative deliciousness and yet it’s so easy to make! Everyone will be wowed and more importantly everyone will have full and happy bellies! Even kids love this pizza… well my kids do anyway but they they can be adventures like that. Growing up, a fancy pizza consisted of one that had more than two toppings on it. A “supreme” pizza was probably the fanciest pizza I had ever known… maybe a bbq chicken pizza for years. Until I became an adult, moved to a more “foodie” area, and suddenly it was gourmet pizzas galore! In fact, where I live, if you look at a pizza menu you see all the gourmet pizzas and then you really have to search the menu to find a plain old pepperoni pizza! This is how I discovered the amazing pear gorgonzola pizza. I had ordered a pear gorgonzola pizza from one of my favorite pizza places (which sadly is no longer in my area) and when I realized how much I loved it, I decided to recreate it myself. The pizza is pretty simple, there’s not really a sauce, just a thin layer of extra virgin olive oil, add a layer of mozzarella, some pear slices, and sprinkle with gorgonzola and thyme. Mmmm It’s good stuff. It’s just as easy to make this gourmet pizza as it is to make a pepperoni pizza so go ahead, impress your friends and family! A word on pizza dough, I never expect a pizza recipe to also provide the pizza dough recipe. The pizza dough is its own thing. It’s also a personal thing; especially since it involves flour. So if you are gluten free, use your favorite gluten free pizza dough. Do you prefer traditional methods that involved soaking your grains? I’ve got a soaked whole wheat pizza dough recipe! I will one day get around to sharing my current favorite pizza dough recipe… For the timid bakers (if you can call pizza dough a baked food) then go ahead and get store bought pizza dough, I won’t tell. Roll out pizza dough on to pizza stone or baking sheet. Remove from oven, spread olive oil on crust. 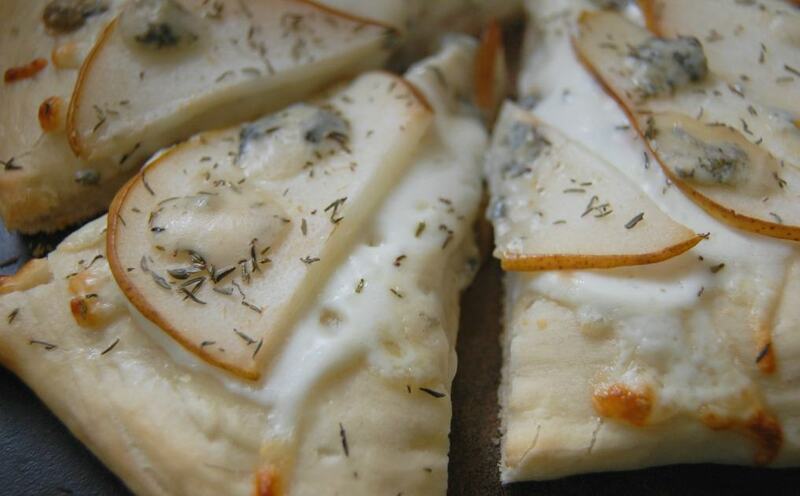 Arrange pear slices on top of the mozzarella. Sprinkle gorgonzola and thyme on top of it all. Place in oven to cook for another 7-10 minutes or until cheese has melted. What a wonderful new twist to pizza – pears. It sounds delicious and looks fabulous. Thanks for sharing on Real Food Fridays. Pinned & tweeted! We have a pear tree, so I’ll have to try this. Thanks for sharing on the Merry Monday party. Pinned. Ok I love pears but would not have thought of pizza with them. Yum. Thanks for sharing this recipe on Let’s Get Real Link Up. I’m not really a pear fan, but I am a believer that everything tastes better on a pizza. 😉 So I might just give this a try… Thanks so much for sharing it with us at Allergy Free Thursdays! This pizza looks and sounds absolutely amazing! Thanks so much for sharing on the Healthy Living Link Party 🙂 We will be featuring your recipe tonight so make sure you stop by and grab your “featured” button! Have a wonderful evening!